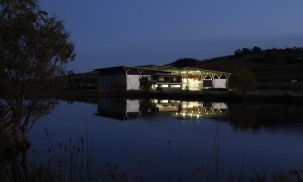 Clover Hill Winery falls under the Taltarni brand and is world renowned for its sparkling wine. The winery has operated for more than 30 years and it has become important for the brand to provide a cellar door at the winery. Very loosely based on a clover leaf form the plan of the new cellar door is centred on an entry foyer which leads the visitor in from the feature walkway past the discrete office and amenities and into the tasting and entertaining area. The entertaining area has been so positioned to capture the views over the vineyard and out to Bass Straight. This breath taking position atop the rolling hills of the property crystallises the efforts of blending the locally grown grape with the beauty of the Lebrina scenery. 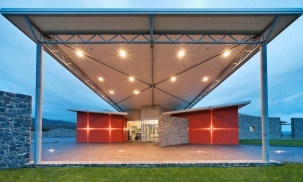 The view around, through and beyond the new cellar door has driven the geometry of the form and this combined with the formal axis set up through the entry forecourt of the winery informed the design, position, and visual and aesthetic linkages. The material selection was based on earthly tones and natural materials. 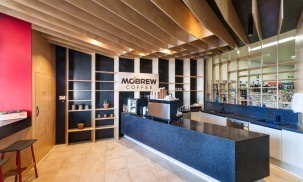 The spine of the building was constructed from rammed earth and the external walls of the building itself being clad in core-ten. The building measures a modest 220sqm but packs an aesthetic punch that compliments the natural beauty of the site. It will be such a joy to enjoy a class of ‘bubbly’ on the north facing deck on a sunny spring day. Here’s to it!